Cranbury, NJ (July 15, 2016)—V‑COMM, an industry-leading telecommunications engineering firm, has been nominated and named by readers as one of the top consultants of 2016, according to RadioResource Media Group’s MissionCritical Communications magazine. V‑COMM, now it its twentieth year of operation, has been nominated previously as one of MissionCritical’s top 21 consultants. 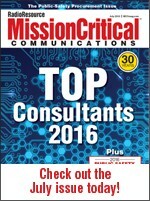 MissionCritical’s Top Consultants issue is now available in print and online. Click here to read this release in pdf format.